The Coalition of Creators and Content Industries and LaLiga have successfully developed the second edition of the awareness workshop program for schools «Defend your rights», offering training on the value of Internet content and the consequences of piracy, and aimed at pupils of 5th and 6th primary school courses and 1st and 2nd secondary school courses. After the excellent results obtained in the first edition of the program, the project has been extended to cover the autonomous regions of Madrid, Castilla and Leon, Castilla-La Mancha and Andalusia, with a growing participation up to 12,000 pupils from 85 primary and secondary schools. The main goals of this campaign are giving value to workers and the creative industries and promoting respect for their rights; motivating pupils as future professionals of these sectors, among those with a higher capacity to create employment of the Eurozone; and showing what trade and fraud of contents or piracy involves for society, employment and the economy. One of the main conclusions of the workshops is that children and teenagers are increasingly becoming heavy users of Internet content, but also creators that need training to disseminate them securely. Two out of three students of 5th course of primary to 2nd course of secondary school share content on the Internet and, although most of them state that piracy harms many people, yet 49.5% consider that it doesn’t harm anyone or only a few persons. When asked if they can discriminate between legal and pirate content, only 39.5% say they are capable to always differentiate them, whereas 38% say they can do it only some times and 22.5% of students won’t ever distinguish them. Though 71% of pupils state that accessing pirate content is wrong, 16.8% does not have an opinion on this regard, and 12.2% say they are not aware of doing anything wrong by accessing them. Noteworthy, perception changes with age, and the higher the course, the higher the percentage of students considering that piracy doesn’t harm anybody. That is why it must be especially valued that these workshops have shown efficient as a tool to raise awareness on the severity of the problem: while 55.8% of the students that did not participate in the workshops consider piracy as negative, the percentage with the same perception rises to 71% among those who took part in them. 30.8 % of 10 to 14 year-old students (primary 5th to secondary 2nd courses) that did not receive training consider that piracy doesn’t harm anyone, while only 7.8% of those who did attend training stated the same. This represents a 75% awareness raise. 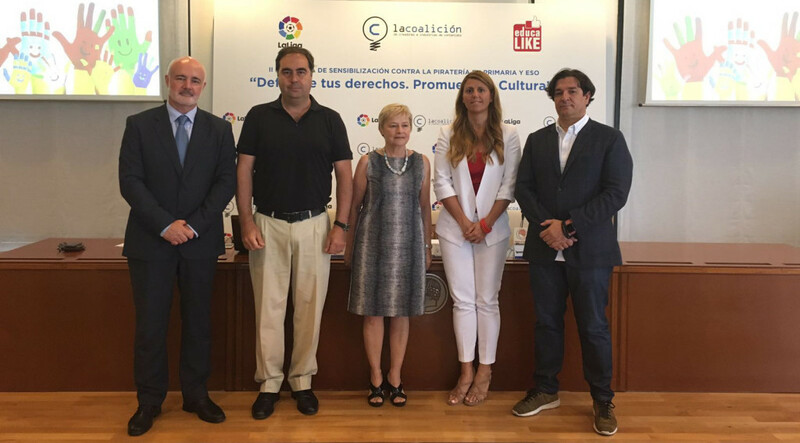 The Director of La Coalición, Carlota Navarrete, highlights: «We are very satisfied with the experience and we believe that a good law and an effective implementation are key, but only if they are accompanied by awareness measures that allow society to say ‘no’ to fraud of contents on the Internet, with zero tolerance to illegal offer, and to propitiate the enhancement of value of a strategic job and wealth creating sector such as the content industry. Projects with schools have been successful in countries such as England, France or the United States, and we want to call on the public authorities to get involved in these awareness-raising efforts because they can decisively contribute to reduce piracy rates in Spain». Ignacio Martínez Trujillo, Managing Director for innovation and global development at LaLiga, points out: «We need to be able to build and share with kids and teens the relationship models and the limits of the digital economy, in which they will not only be future consumers but also future professionals with rights». «Success of the two project editions makes us think about the great importance of standing for a clear message from the institutions, which in other matters such as recycling or road safety works with excellent results. Awareness efforts by public authorities and the industry throughout the educational cycle can result in great benefits for the future generations habits», the programme promoters add.